Attention: Do you need shipping materials? 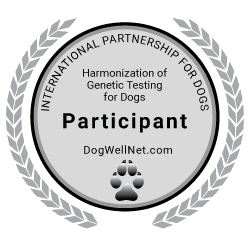 We provide a free test kit if the sampling will not be performed by your vet or clinic. The test kit contains two cotton swabs or zipperbags for horsehair for sampling and a protective bag. Would you like to add a test kit to your order? No, thank you! Yes, please! This disease is caused by a mutation in the KRT10 gene. The keratin defect leads to superficial, mild, plantar epidermolytic hyperkeratosis with epidermal fragility. Affected dogs show clinical signs from birth through adulthood. In adults clinical lesions become hyperpigmented and remain static. * All prices include statutory VAT. Delivery within Germany is free of charge.